We have two types of service. We have the fabric of any looks you want to create! Known as Taiwan's premier fashion fabrics store, Chien Long Fang carries an exclusive variety of high-fashion fabrics. We encourage you to pay a visit to Cheng Long Fang's tailor shop. Our showroom features everything from beautiful beaded couture and bridal laces to fine European wool and designer-label silks. You'll also find satins, taffetas, sheers, cottons, stretch fabrics, and velvets in every color imaginable...plus an incredible selection of trims, buttons, and other fine accessories. Since 1980, we have gained recognition through our fine fabrics and customer service. 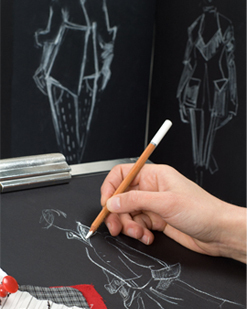 Cheng Long Fang is an expert at making made-to-measure garments with selections of couture fabrics we import from Europe.It's easy to create any high fashion looks with the right fabrics. You are welcome to bring a photo or a magazine page. We will help you find the right fabrics according to your sample picture or ideas. And our most experienced tailor will hand-make the garments you have in mind, with extreme attention to detail. We make all types of male and female garments- dress, qipao, coat, jacket, pants, skirt, and suit.